Gavin’s been feeling under the weather for the past week, so a few days ago we decided to whip up some soup. We had a three pound bag of baby red potatoes sitting on the counter top that we never ended up using for a side dish recipe when we made our cedar plank salmon the other night. It only made sense to cook a warm and creamy baked potato soup. Typically we make baked potato soup in a dutch oven but Gavin didn’t want to wait that long. A sick man needs his soup urgently! 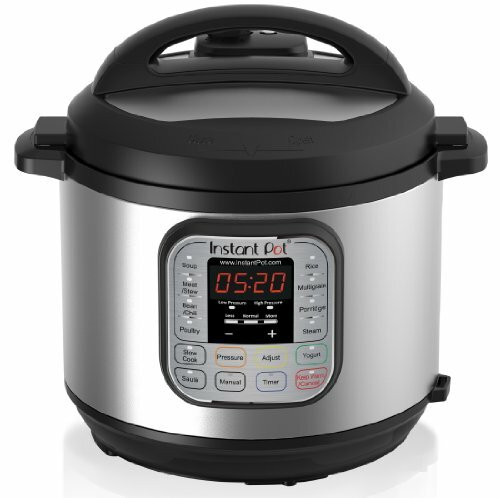 We pulled out our instant pot in order to use the pressure cooking mechanism to soften the potatoes quicker. It turned out so perfectly creamy that we’ll never make it the old fashioned way again. And with all soups, the leftovers get better as the days go on. Today is the first “cold-spell” here in Texas. The temp dropped about 35 degrees overnight and it is it pouring sheets of rain. Karen’s family in Minnesota experienced their first snowfall of the season last night (in the middle of October, what the heck?! ), so it only seemed fitting that the internet world was in need of a warm and delicious soup recipe. If you don’t have an instant pot, you can still make this soup, it will just take a bit longer. Put the ingredients in a crockpot or dutch oven and cook until the potatoes start to easily crumble apart when poked with a fork. Enjoy this warm, comforting, and filling soup! Start by chopping your bacon into bite-sized pieces and searing your bacon in the instant pot by using the saute/brown setting. Once the bacon is crispy, use a slotted spoon to remove the bacon to use as a garnish and leave the bacon renderings in the instant pot. Add the diced sweet onion and saute until soft and translucent. Next add the garlic and saute for about a minute, until fragrant. Sprinkle the flour into the pot and stir until combined with the garlic and onions. Next, add the chicken broth and whisk together until well combined. Add a generous amount of salt and pepper, plus the diced red potatoes and celery. Cook on high pressure for 20 minutes. Carefully release the steam in the instant pot and remove the lid. It will seem like a lot of liquid but will thicken up as you mash the potatoes and add the milk and cheese. Use a potato masher to gently smash the potatoes to your desired thickness. We prefer to leave it a bit lumpy. Next, add 1 cup of cheddar cheese and the milk/flour mixture. Stir until well combined and season with additional salt and pepper. To garnish, top with cheese, bacon bits, and sliced green onion.